A new round of talks on the use of so-called killer robots reopened at the United Nations on Monday, with a focus on defining the characteristics of autonomous lethal weapons. 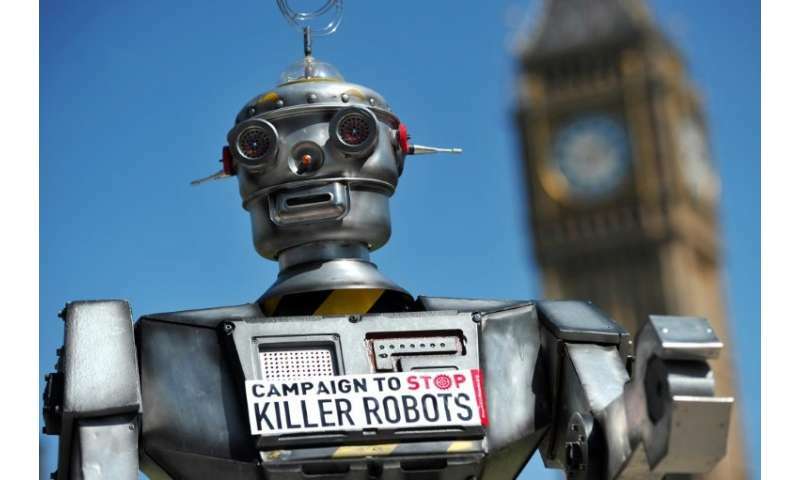 The world body hosted the first-ever killer robot negotiations last year and agreed to move forward, even if a treaty governing the use of such weapons remains a distant prospect. Activists say time is running out before weapons are deployed that use lethal force without a human making the final kill-order and have criticised the UN body hosting the talks—the Convention of Certain Conventional Weapons (CCW)—for moving too slowly. But they still praised the resumption of the UN talks. "It is a much more focused discussion now," said Richard Moyes, co-founder of the Campaign to Stop Killer Robots. Nations "are getting down to the business of describing the level of human control that is needed over (lethal weapons) systems," added Moyes, also a member of the 2017 Nobel Peace winning International Campaign to Abolish Nuclear Weapons. For Moyes, it is crucial that states agree a human using any weapons "has to know where force is going to actually be applied and when force is going to be applied". The number of states that have called for an outright killer robot ban has mounted, while concern in the private sector and academia has grown over the threat posed by weapons that entirely rely on machine intelligence in deciding what to kill. But the states believed to have the most advanced autonomous weapons—notably the United States, China, Russia and Israel—have not committed to any form of binding mechanism restricting their use. The CCW talks are being led by India's disarmament ambassador, Amandeep Gill, who said the two weeks of talks running through April 20 would focus in part on "the characterisation issue", meaning working on a definition of autonomous weapons. He acknowledged that the pace of the talks had proven frustrating to some. "We are struggling and we are struggling for a good reason because these are complex issues," he told reporters last week. "But I think the important point is that the UN system is making a deliberate, conscious effort," Gill added. Moyes conceded that nothing concrete would likely emerge in the April meeting but activists hope that with two more sessions scheduled this year nations would agree to move on to formal negotiations on a binding treaty.